In the previous articles written about Xinfin in Africa. It has been shown that the possibilities of XinFin’s XDC01 protocol are limitless for its attributes. This article will cover the possibilities of XinFin’s solution in the African E-commerce sector. XinFin is a hybrid blockchain that encourages interoperability with other blockchains. It is a fork of both Ethereum and Qurom with the advantages of both. XinFin has the private and public blockchain attributes. In essence, anyone in the public can see details of transactions that are public. Only authorized members of a master node’s sub-network can have access to the details of a transaction that is broadcasted privately. 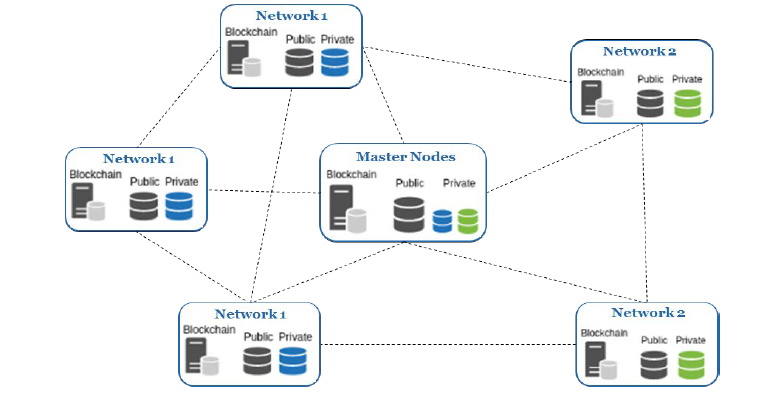 It means that a master node holder can create a sub-network where the details of transactions are only visible to the sub-network while it is seen as a mere transaction with hidden details on the public chain. This can be a real aid to organizations and governments who take matters of security and secrecy seriously. Hybrid blockchains like XinFin has more use cases than any blockchain that ever existed. Some feautures that made XinFin special, better, and different from other blockchains. XinFin is seen as the first blockchain technology to have a KYC layer. A master node holder on XinFin has to be KYCed. It is the only blockchain that has the capability to separate the blockchain application from Cryptocurrency. It means that on XinFin blockchain solutions can be applied without the use of Cryptocurrency. Check out one of the solutions of XinFin that allows a permissioned and private blockchain to be used for land registry without Cryptocurrency in countries that banned cryptocurrency like India. It is the ONLY blockchain that has the private and public blockchain attribute. XinFin uses the DPoS(link) consensus, or it can be called the XPoS – The XDC01 protocol. This has the Delegated Proof of Stake and Proof of Authority attribute. It has more use cases than many blockchains out there. While many are for remittances, XinFin surpasses them all with numerous use cases and applications. 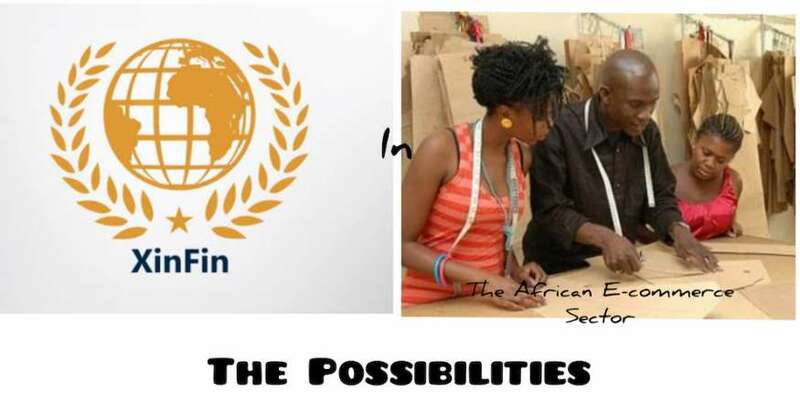 This article will be the last of its series about XinFin in Africa: The possibilities. Check out the previous articles below. It was a sunny day in the fall of 2018, I had met a longtime friend of mine in the largest city in Africa. 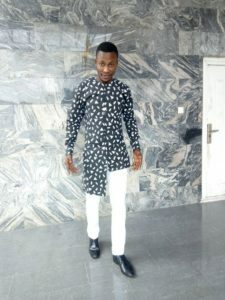 My friend is a creative fashion designer, he literally creates his own style. We were sharing some design ideas when it struck me that there are a lot of youths in Nigeria striving for visibility. Many of them are in fashion designing, they are creative. Visibility: Many of them have no other customer other than those in their circle of influence let alone being a supplier to the outside world. Cross-border transactions: Even if they have customers from other countries, settling payments will still be a challenge as it takes a long term for sent payments to deliver. This is without reference to huge transaction fees for fiat remittances. Trust: They face trust issues especially for customers from long distances. It will take a lot of recommendations from trusted people before anyone they didn’t know (especially from faraway places) could become a customer. Most online shops today are not suitable for an average African entrepreneur. There is a list of documents needed to be a registered seller on these platforms which they do not have. If it had been to complete KYC it would be easier for them. This is apart from the fact that listing fees for these e-commerce platforms are huge and platform fee can be extremely high because of the payment processors used. Many enterpreneurs do not want to accept cryptocurrency as payments because they fear the inconsistent price movements. Etc. These challenges are what I couldn’t possibly solve with my very little knowledge and sloppy design on Fashion-0 (I am a writer for crying out loud-Smiles). But I have been looking out for the most suitable blockchain technology that can easily put an end to these challenges. After getting to know about XinFin through CryptoMentor99, an ardent supporter of XinFin, and Sydney Ifergan who had been an advisor to XinFin and the owner of The Currency Analytics (a top google approved news platform built on the blockchain technology), I made my own research about the project. After the research, I was convinced beyond doubt that XinFin has/is going to provide the most suitable solution for e-commerce for SME’s in Africa. Let’s take a look at TradeFinex one of the d’App on the XDC01 protocol that had been a central attraction personally for me and how it could possibly help young African Entrepreneurs in their businesses. The concept of XinFin’s TradeFinex has been touched briefly in the two previous articles, read them. TradeFinex is specially created to cater for some major challenges facing Small-Medium Scale Enterprises (SMEs) all over the world. The suppliers can come on the platform to gain greater visibility as users from all over the world are there. Suppliers can put up their products on the platform, an end user can browse through and find any of the Supplier’s product. Through interaction, they can agree and close the deal. They will then be required to sign a smart contract on the platform based on their agreements. Their wallets will be connected to the smart contract for automatic deduction and remittance of funds as the terms on the smart contracts are completed and the goods are delivered. The smart contract will ensure a trustless interaction between both parties without the need for intermediaries. Remittances can be made in XDC which is very fast in delivery and exceptionally low transaction fee. Payment with XDC will cut the delays in cross-border payments which usually takes days when it is done with banks. Though TradeFinex has provided one of the basic solution for SMEs especially for those from third world nations, I am proposing a platform that has some additional features tailored to specifically help entrepreneurs from third world nations. Some of these proposed features have been explained above with words on the basic intention behind Fashion-0.site. The proposed platform is envisioned to be a blockchain based e-commerce platform that also incentivizes talents in young entrepreneurs (The Proof of Talent or Proof of Fashion Consensus model). The platform should be open for registration as an end user or Supplier. The platform should be one that has a thorough KYC procedure like life uploads of Files. KYC documents and photographs should only be ‘uploadable’ at the time of verification through life cam. This means it should not be possible to upload confirmation documents like photographs from internal storage to prevent being photoshopped. There should be backend agents that should be ready to confirm the identities of prospective members via video calls and interviews. This will cater for endless documents required for listing on e-commerce platforms out there. There should be a considerably low listing fee accepted from entrees and if possible, it should be made free. None the less, members (suppliers or SMEs) should be mandated to lock up some amounts (reasonably low amounts) of XDC tokens on their wallets with the proposed platform. This will be used to cater for any dispute and ensure seriousness. The locked-up amount should be available for withdrawal for the users in case they wish to pull out. The platform should have a private chat where users and suppliers are able to chat, make deals before proceeding to sign smart contracts. This private chats can be recorded on a private blockchain only accessible to the sender and the recipient. I suggest that all user profiles should be stored on the Xinfin’s private blockchain. This will be possible since the whole platform can be seen as a master node and the accounts as a sub-network. 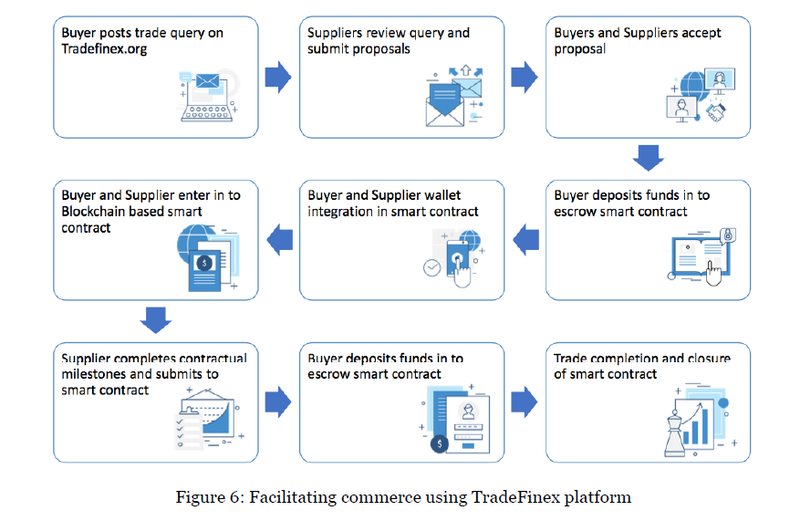 The platform should have smart contract creation and deployment tool to facilitate the agreements of parties, such as on TradeFinex. The IoT integration can later be used to help both the end user and supplier to keep track of the goods sent, when dealing with cross-border transfers. The platform should have ratings for all users who have transacted or interacted before to help other users. These data should be stored on the public blockchain where it can be seen by all. There should be XDC wallet integrated on the platform. This wallet should have the feature that allows users to choose either to keep their funds in XDC or a stablecoin like USDT. This will arrest the fears of entrepreneurs who do not want to accept cryptocurrency as a payment option because if the constant price fluctuations. The wallet can also have a swap feature that allows users to quickly and easily change their cryptocurrencies to other ones without the need to register on multiple cryptocurrency exchanges. The platform should be one that appreciate and incentivizes entrepreneurs for a job well done through community choice and votes. Good fashions or works uploaded on the platform should have options to like or upvote by the community members. Each post should be likeable, with public comments section, and tags (just like social media today). Each member’s vote should carry a weight which should be determined by how many tokens they lock up on the platform. This will encourage activeness and participation of the community members. The reward pool can be taken from the master node rewards and helps received by the project from time to time. The reward should be distributed to suppliers based on some criteria like ratings (from completed trades, number, and weights of likes and upvotes gotten on works uploaded). The distribution of rewards can be as frequent as master node rewards are given by the XinFin network or daily. This will encourage suppliers and push them to be better always in their works. Anyone can be on the platform, suppliers who are entrepreneurs with small-medium enterprise, investors who are looking for talented minds to invest in, or end users who wish to look beyond borders top get quality products. The benefits of this proposal have been clearly stated in this article. This will increase the usecases for XinFin and help entrepreneurs from third world countries. The Currency Analytics and FinancialReport24 always deliver up to date, REAL and Auuthentic news about cryptocurrency. We care about the information you read about cryptocurrency because we believe in it, that is why we work to deliver unique news and details that cannot be found anywhere on the internet. Always visit the websites to keep yourself updated. TCAT has recently been listed on Coinmarketcap, this is the proof of our uniqueness and hard work, join us today! Shoot me an email at [email protected] if you need to discuss with me personally.